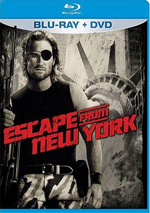 In this unrelenting action masterpiece from director John Carpenter, a police station under siege from a vicious street gang becomes a cataclysmic battleground where only the strongest survive! 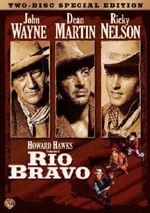 Inspired by Howard Hawks' immortal western, Rio Bravo, this explosive gem from one of cinema's great frightmasters has been newly remastered with a host of high-powered extras! Not too long before he hit it big with Halloween and became best known as a horror director, John Carpenter dabbled in other genres. Mostly influenced by westerns, 1976’s Assault on Precinct 13 creates a fairly tight little thriller. Set in the crime-ridden Los Angeles suburb of Anderson, the movie opens with a police ambush that results in the shooting of six members of a juvenile gang. We later see more members of that group. Called Street Thunder, they prowl Anderson and attack with no warning. In the meantime, police Lt. Ethan Bishop (Austin Stoker) starts his first night on the job, when he gets a bland assignment: he deals with the closing of Precinct 9. They’re moving the station elsewhere, so he needs to tend house during the final nighttime transition. When he arrives, he meets the remaining staff, including secretary Leigh (Laurie Zimmer) and phone operator Julie (Nancy Loomis). Special Officer Starker (Charles Cyphers) needs to transport some inmates north to a prison. This small group of criminals includes the notorious Napoleon Wilson (Darwin Joston), a slick dude with a cigarette fetish. When one inmate gets ill, they take a detour and use the almost abandoned Precinct 9 building as a quick holding tank. We still need one more component to complete the puzzle, and we get this as we see Lawson (Martin West) and his daughter Kathy (Kim Richards). His mother still lives in Anderson, and he heads to her house to convince her to leave. The majority of the story hinges on what happens with Lawson and Kathy. I won’t reveal what does occur, since I’d prefer to leave some spoilers intact, but these actions ultimately lead to a siege on the barren Precinct 9 building. The members of Street Thunder attack the sparsely populated location, so that undergunned skeleton crew needs to fend off the thugs as best they can. So there’s your titular assault! Essentially Assault spends about half the movie as it builds to the attack, and the rest depicts that action. In today’s marketplace, that probably seems slow. Heck, during his commentary on this disc, Carpenter states that he likely took too long to get the battle going. I disagree, as I think one of the film’s strengths stems from its slow and deliberate pacing. Too many movies almost totally omit any form of exposition and just toss us into the action with no form of anticipation, whereas Assault goes firmly in the other direction. Carpenter gradually builds the tension to the point where it becomes almost excruciating, and this becomes one of the film’s main strengths. Carpenter also delivers pretty solid action once we get there. Despite a somewhat anti-climactic ending, the movie’s second half mostly provides lively battles once the gang members set upon the precinct. He stages the fights with flair and aplomb and allows them to satisfy our desire for some good old-fashioned nastiness. Not that everything about Assault works well, and the cast seems fairly amateurish. No one stands out from the pack, and while I don’t think any of them harm the flick, none of the actors contribute much to it either. Carpenter’s editing needed some work too, as the movie sometimes moves in a choppy manner. Chalk all that up to growing pains - after all, Assault on Precinct 13 was just Carpenter’s second movie. Despite some awkward moments, the movie prospers due to a sense of energy and general passion. A fun and exciting flick, Assault stands up well among Carpenter’s other releases. 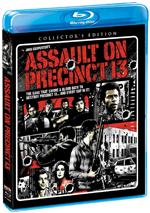 Assault on Precinct 13 appears in an aspect ratio of approximately 2.35:1 on this Blu-ray. While not a sparkling image, the transfer usually seemed positive. Overall sharpness appeared fine. Interiors could be a little on the soft side, but those weren’t a major concern, and most of the flick came across as pretty accurate and distinctive. Jagged edges and moiré effects also created no concerns, and I noticed no edge haloes. Grain remained natural, and print flaws remained minor; I saw a few small marks but nothing intrusive. Colors mostly appeared acceptably concise and natural. They never excelled, but they appeared fairly full and well-developed. Black levels were reasonably deep, and shadows followed suit. The low-light shots periodically seemed somewhat too thick, but most of them appeared quite easy to discern. This ended up as a mostly strong image. In addition to the movie’s original monaural audio, we got a remixed DTS-HD MA 5.1 soundtrack. While it didn’t go crazy, it used the five channels to open up the material in a satisfying way. Music showed good stereo spread, while a mix of effects appeared from around the room. These became most notable in the action sequences; for instance, gunshots emerged from logical spots. The remix broadened auditory horizons in a modest but convincing manner. Audio quality held up fine after 37 years. Speech sounded natural and crisp, as those elements seemed above average for the era. Music also was nicely rich and dynamic. High-end came across as a little shrill, but the score presented good bass response. Effects occasionally demonstrated a little distortion, mostly due to gunshots. Otherwise those elements were fairly accurate and concise. Nothing about the mix dazzled, but given the film’s age and origins, it worked well. How did the Blu-ray compare with those of the 2003 DVD? Audio differed partly because the DVD lacked the 5.1 option. The Blu-ray’s mono track was a bit more dynamic than the one heard on the DVD, and obviously the inclusion of the multichannel mix added a nice option. In terms of visuals, the Blu-ray was tighter, cleaner and better developed. It offered a clear improvement. The Blu-ray comes with the same extras as the DVD and brings in some additional ones. We get two audio commentaries, the first of which features director John Carpenter, who offers a running, screen-specific discussion. I believe this originally appeared on a 1995 laserdisc as well as the 1997 DVD. The veteran of many other tracks of this sort, Carpenter usually records with others, so this becomes an unusual circumstance for him. When paired with a collaborator, Carpenter often flourishes, so that interaction seems missed here. Carpenter does manage to make this a moderately entertaining track on his own, though. He starts well as he discusses the project’s origins and influences as well as the cast and the challenges of low-budget filmmaking. Two themes dominate the commentary: the issues connected to the lack of money and time, and Carpenter’s inspirations for parts of the film. Carpenter gabs about Howard Hawks quite frequently; he relates his cribs from Hawks’ flicks in a nicely open and ego-free manner. Unfortunately, Carpenter often tends to just tell us about the action on-screen. The track doesn’t sag a lot, but it runs into more than a few slow points. Empty spaces don’t seem prevalent, but they also pop up a little more than I’d like. Overall, this commentary is an above-average one and it gives us a pretty nice examination of the film, but it doesn’t live up to the high quality of some other Carpenter tracks. For the second commentary, we hear from art director Tommy Lee Wallace. Along with disc producer Michael Felsher, he discusses sets, locations, and production design, shooting anamorphic and camerawork, cast and performances, influences, music, editing, effects, working with Carpenter, and other aspects of his career. Affable and engaging, Wallace gives us a good look at various aspects of the film’s creation and other areas. Wallace wore many hats during the low budget shoot, so his title of “art director” doesn’t cover all the bases; he manages to touch on many areas during his commentary. Some may feel frustrated with the amount of time Wallace spends on semi-related areas like later projects and the current state of filmmaking, but I think the track holds together well. The disc also includes an isolated score. Carpenter’s music appears on its own in Dolby Digital stereo form. This makes it a nice treat if you like movie scores. We also find the film’s theatrical trailer and two radio spots that are fun to inspect. A Still Gallery presents 40 images that mix shots from the set, movie elements and promotional materials. It becomes a decent collection. Recorded in early 2002, we get an interview with John Carpenter and actor Austin Stoker. Shot during a group chat at the Egyptian Theater in Hollywood, an interviewer asks questions for about the first half, and then the audience kicks in for the second part of this 23-minute, seven-second program. To put it mildly, Carpenter dominates the piece. Stoker only speaks for a few brief moments, as the director gets the vast majority of the questions. These cover Assault, his career in general, and his thoughts on topics like the use of digital video for low-budget filmmaking. Not too much of it repeats what we hear in the commentary, and it seems like a lively little discussion. Two new featurettes fill out the disc. Bishop Under Siege runs seven minutes, 48 seconds and provides more info from Stoker. He talks about what got him into acting and aspects of his career, how he came to Precinct and his performance, thoughts about his collaborators, and the flick’s legacy. Stoker doesn’t give us a ton of information, but he provides a few fun thoughts. The Sassy One goes for 12 minutes, 43 seconds and involves actor Nancy Loomis. She covers her interest in acting, latching onto the film and her work in it as actress and other positions, specifics about the story and Carpenter’s desires, the movie’s release and her subsequent career. Loomis delivers a pretty terrific little chat. Though not the most consistent film, Assault on Precinct 13 offers enough excitement and raw power to make it a solid action flick. The Blu-ray delivers good picture and audio along with a satisfying set of supplements. Fans will feel happy with this release, as it brings us a high-quality rendition of an effective movie.